Universal Fantasy Tarot is a deck based on the high fantasy novel genre, the imagined literary setting fathered by J.R.R. Tolkien whose Middle-Earth is a blend of magic and the Middle Ages, and is inhabited by dragons, undead, demons, elves, dwarves, wizards, and heroes. This deck pictures all of these plus more mythical creatures: giant rodents, centaurs, satyrs, giant lammergeiers, water sprites, enormous flying snails, etc. The palette used by artist Paolo Martinello (Mona Lisa Tarot)is predominantly cool blues, greys and greens instead of warmer yellows or reds, and the court cards are serious and rarely smiling. Even usually positive cards like the Sun or the Two of Chalices shows people with serious expressions, giving this deck a melancholy vibe. 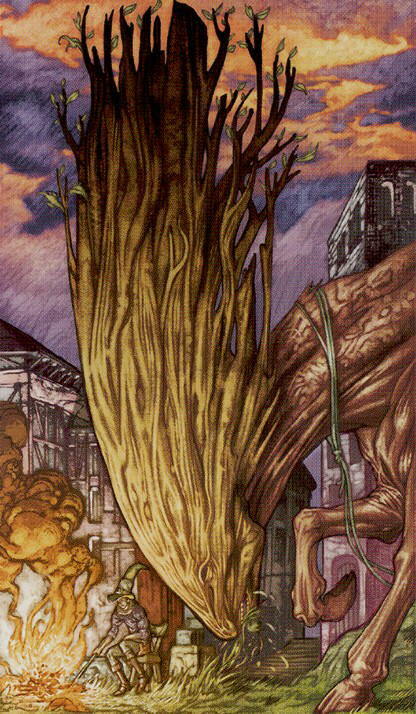 The Ace of Wands has a cloven-hoofed, muscled animal with a giant head like a cluster of sprouting branches, that makes the shape of the club that appears in more standard depictions of this card.